Any person who is studying in an academic or educational institution undergoes a very hard period of studies and routine. After completion of their degree or academic program, they need to apply in different organizations and institutions for the job and other work related arrangements. But all organizations require a detailed record of the academic performance of these potential employees and need the validation of their educational claims. For this purpose, the candidate needs to submit a transcript or mark sheet. A transcript is a document prepared by the educational institution that provides a detailed break-up of the all the marks and grading that the student has achieved during the course of studies. This can be a current institution or a former one. In international universities, the transcripts are often provided in the local language of origin. In that case, the candidate may need to provide a transcript in the native language along with a translated version of the same that is duly stamped and counter signed by the university officials and the authorized translator. The authenticity of the transcript is gauged by the official seal and stamp of the educational institution and signature of the authorities. Sometimes attested photocopies and scanned versions are also accepted. What is transcript request form? 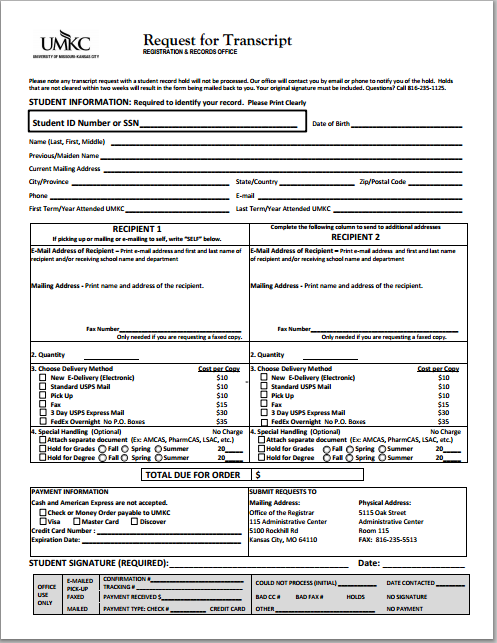 A transcript request form is an application form that is submitted to the specific institution for the issuance of the transcript. It is filed by the student desiring the transcript. The form contains a request for issuance of the official break down document or the transcript.